With 9-15 sets of twins among every 1000 live births, it’s not surprising that twins, especially the more common fraternal twins, are well-represented amongst the celebrity population. However, unlike stars like identical twins Tia and Tamara Mowry and fraternal twins Ashley and Mary Kate Olsen, whose twin status is a critical component of their fame, some celebs have twins who are off the public radar. Since right now, people with the astrological sign of Gemini – that’s the twins, remember – are celebrating their birthdays, let’s celebrate along with them with these 10 stars whose twin status may surprise you. Isn’t it “Ironic”? Alanis Morrisette has a fraternal twin–who’s also involved in the music industry. Her twin brother, Wade Morrissette, is an indie pop and kirtan (a musical form of Sanskrit chanting) performer and also works as a yoga instructor. In in an interview, Alanis noted that while the pair’s musical styles are different, she and Wade share “this feistiness for personal truth rather than inauthenticity,” a quality that comes out in both artists’ music. Wade even once opened for Alanis during a concert tour. While Linda and Leslie both grew up doing community theater in their hometown of Salisbury, MD, only Linda pursued a professional career in acting. Aside from her brief foray in Terminator 2, Leslie has stayed out of the limelight, instead pursuing a career as a nurse in New Jersey. Nonetheless, Linda notes in an interview that the two can be eerily on the same wavelength, both separately buying the exact same Father’s Day card for their dad one year. Ashton Kutcher and his fraternal twin brother Michael were different from the start. In fact, the arrival of twins was a surprise; until just before their mom went into labor, the Kutcher parents were expecting just one son. Christopher Ashton, who Michael jokingly calls “Jabba the Hutt,” was born first, tipping the scales at 10.5 pounds. Michael, who was eventually diagnosed with a mild form of cerebral palsy, was born a few minutes later, weighing just four pounds and facing immediate health challenges. At the age of 13, Michael’s health worsened to the point that he required a heart transplant, waiting on the list with doctors forecasting he had only hours to live when a matching donor was located. When Michael woke up with his new heart, he was reassured by the sight of his family, including Ashton, crowded next to him in bed. Did you know that there’s a female Jack (Jacqueline?) Bauer out there? Keifer Sutherland has a fraternal twin sister, Rachel Sutherland—and the family resemblance is striking. The pair were born in London on December 21, 1966 to Shirley Douglas and Donald Sutherland, meaning that life on the public stage was part of their bloodline. Donald Sutherland has enjoyed a long acting career, most recently assuming the role of President Snow in the Hunger Games movies, while Shirley Douglas was an actress and member of a prominent Canadian political family. Kiefer, the oldest twin by seven minutes, initially swore that he wouldn’t follow in the footsteps of his famous parents, but got bitten by the performance bug by watching his mother onstage, eventually joining a youth theater group. He went on to a successful career in acting, winning an Emmy, a Golden Globe, and two Screen Actors Guild awards for his portrayal of intense anti-terrorism agent Jack Bauer on the Fox series 24. Rachel, meanwhile, pursued a career in show business as well. However, unlike her brother, she stays behind the camera, working as a Post-Production Supervisor. The family’s involvement in show business goes beyond Kiefer and Rachel: Kiefer’s daughter, Sarah Sutherland, plays first daughter Catherine Meyer on Veep, and the twins’ half-brother, Rossif Sutherland, has also appeared in films and on television. When you first hear that supermodel Gisele Bundchen has a twin sister, you can’t help but hope that the two are identical, doubling the beauty of Gisele’s world-famous visage. Alas, this isn’t the case—the sisters are fraternal twins. But don’t feel too bad for Gisele’s twin, Patricia—she’s a beauty in her own right. The twins are part of a large family from Horizonta, a Southern Brazilian village, where like the Bundchens, many families trace their ancestry to Germany. There are six sisters in total: Gisele, Patricia, Raquel, Graziela, Gabriela, and Rafaela. One can assume their dad spent the ladies’ teenage years frantically fending off hordes of potential suitors for his beautiful brood. The twins, along with their sister Gabriela, who is one year younger than the pair, were inseparable as children, often called the “Three Musketeers.” Believe it or not, Gisele says that Patricia was the more popular of the two, and Gisele reports feeling like “the weirdest thing that ever walked on earth” as a tween, when her tall thin frame towered above not only her sisters, but all of her male classmates. However, when Patricia, Gabby, and Gisele were enrolled by their mother in modeling classes, it was Gisele, and her runway-ready body, who attracted the eye of a scout. Gisele would eventually leave her family at age 14 for a career in modeling that would catapult her into superstardom. Patricia works as Gisele’s spokeswoman and advisor. The two sisters, along with the rest of the Bundchen brood, remain very close. In a 2015 post celebrating their shared 35th birthday, Gisele thanked her sister for always being there for her, tagging a photo of her and her twin #bestfriendintheworld. You may have already heard of at least one of the siblings of British actor Joseph Fiennes, who starred as William Shakespeare in 1998’s Academy Award-winning film, Shakespeare in Love. His older brother, Ralph Fiennes, is also a well-known actor, having been twice nominated for Oscars for his performances, which include portraying a Nazi war criminal in 1993’s Schindler’s List. More recently, Ralph played Lord Voldemort in the Harry Potter films, and M in the James Bond films. Ralph is certainly the most famous of Joseph’s six siblings, but while he and Joseph share a passion for acting, they don’t share a birthday. That honor belongs to Joseph’s fraternal twin brother, Jacob Fiennes. Jacob, known as Jake, along with foster brother Michael, who is an archeologist, are the only Fiennes siblings not to seek a career in the arts (sister Martha is a director, brother Magnus is a composer, and sister Sophie is a director and producer). Instead, Jake works as a gameskeeper, overseeing a 2,500-acre estate in Norfolk for his employer, Sir Nicholas Bacon, a life his brother Ralph has said he envies. Unlike his celebrity twin Joseph and older brother Ralph, Jake’s brushes with fame have been confined to interviews related to conservation efforts for Britain’s endangered hen harrier. 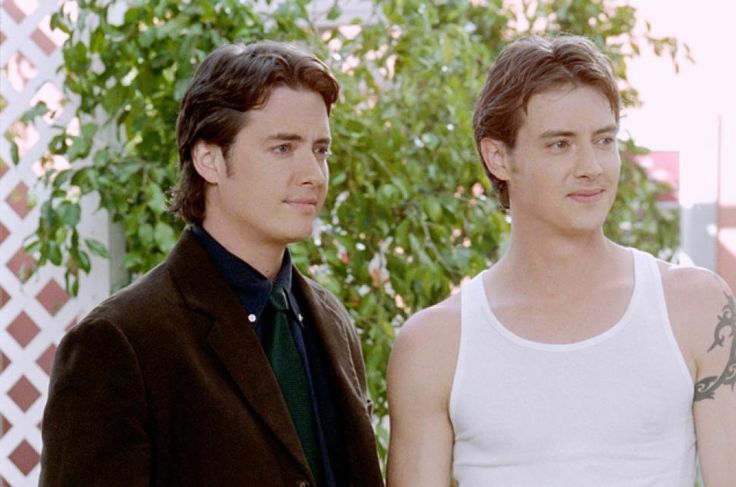 Neither Jeremy or Jason London ever reached dazzling heights of fame, which is how you may have seen the brothers as interchangeable, perhaps not realizing that the guy that you were watching in Party of Five was not the same actor you had seen in Dazed and Confused, but rather, his identical twin. Jeremy is best known for his television roles as Griffin on the Fox series Party of Five and as a young minister on the WB drama 7th Heaven. While Jeremy is largely known for his TV roles, Jason made his mark in film, as Randall “Pink” Floyd in Dazed and Confused. The twins appeared together onscreen only once, on an episode of 7th Heaven, though they competed for the same role in Man in the Moon (Jason won it and Jeremy worked as his stunt double). Sadly, the brothers don’t just share their appearance, but also a predilection for trouble. Jason was arrested after a 2013 altercation at a bar and Jeremy struggled with addiction, appearing on Celebrity Rehab with Dr. Drew. If you saw the short-lived 2006 E! reality series, House of Carters, you may be already be familiar with the structure of the dysfunctional Carter family. Otherwise, you have probably only heard of former Backstreet Boy Nick Carter and his younger brother, Aaron Carter, whose pop hits made him a teenybopper idol in the early 2000s. However, Aaron and Nick are just two of the five Carter siblings. The Carter brothers have three sisters (one, Leslie, died tragically of a drug overdose in 2012), including Aaron’s fraternal twin, Angel, who is a model. Angel doesn’t much resemble her twin brother, with dark hair in contrast to Aaron’s signature blond locks, but the two share a bond that goes beyond their physical appearances. While the Carter family has faced significant turmoil, from the alleged financial mismanagement by the Carter parents that led to Aaron’s 2013 bankruptcy, to addiction struggles, to drama in the wake of Leslie’s death, Angel and Aaron have remained close. At Angel’s 2014 wedding, Aaron enthusiastically walked his twin down the aisle and Angel later shared her pride and gratitude for Aaron’s involvement in her life and her wedding over Twitter. Scarlett Johansson has a hot twin sibling?! How did this fact stay (relatively) off your radar? For starters, he’s a he. Hunter Johansson, who’s the younger of the fraternal twins by three minutes, appeared in the film Manny & Lo with his sister when both were in their tweens. However, while Scarlett pursued a career in acting, eventually starring in critically acclaimed films including Lost in Translation and Her, Hunter followed a different path, and one that allowed him to have a more private existence than his famous twin. Hunter worked in as a community organizer in New York City, and then as part of the Obama campaign. The Johansson twins turned heads in 2014, when Hunter served as Scarlett’s date at a fundraiser for Hurricane Sandy victims. While onlookers were initially surprised to see Scarlett on the arm of someone other than the fiancé and father of her baby, Scarlett quickly introduced her handsome twin, noting that she’d asked him to accompany her to the event because the pair were raised in New York and share a love of the city. Vin Diesel’s twin brother was able to stay out of the public eye for a long time. How? For starters, Vin Diesel is a stage name; the name on the star’s birth records is Mark Sinclair, and his twin brother was born as Paul Sinclair. Both boys eventually took on the last name Vincent, after the stepfather who raised them (Vin Diesel has indicated that he had never met his biological father). Additionally, Vin and his brother, Paul Vincent, are fraternal twins, meaning that the resemblance between them isn’t strong enough for their connection to be immediately apparent, especially as Paul has a full head of hair (in contrast with Vin’s signature shaved head). Notoriously private Vin didn’t want his fame to impact his twin’s quiet existence. However, the tabloids’ obsession with identifying “Twin Diesel” did not abate and an unrelated man was incorrectly identified as Vin’s “secret” twin. At this point, Vin shared a photo of his brother Paul Vincent (alongside the late Paul Walker), who works behind the scenes as a film and sound editor.